Wall sundial for displaying Local Apparent Time (LAT). Aluminium composite board with foil lettering. Adjustable bracket and stainless steel gnomon. We offer the SCALA vertical dibond wall sundial, finished in white varnished aluminium composite (dibond) with foil lettering, as a value-for-money alternative to our aluminium and glass sundials. The foil lettering has been tested in the automobile industry and stands up to the test as weatherproof and colourfast. We use cast foils from 3M, the market leader. The SCALA displays local apparent time (LAT). It is calculated and manufactured specifically for your wall. Location and geographic coordinates are displayed on the face. You can attach the adjustable stainless steel wall bracket by its slotted holes using rawl plugs and screws. The face is hung up spring loaded at three points, so that the sundial can be easily adjusted using the three holding screws. You can also fine tune the time display in the same way. Please refer to the illustrated manual for more detailed information on assembly and adjustment. You will also receive a table which you can use to read the daily difference between Central European time (CET) and local apparent time (LAT) for your location. Note: The sundial motif shown can only be used for a southern deviation to the west or east of up to 50°, since this is the only case in which the hour lines are arranged like the Sun's rays. 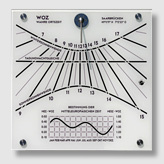 East and west sundials >50° are possible but will require a specially made gnomon. Please supply us with your address details (street, town) and the wall's cardinal direction (southern deviation) when ordering your sundial. If you do not know this, we can calculate it for you with Google Maps or from your land register. You can find more detailed information in the document "Order details for wall sundials". If you would prefer another size or design, please contact us directly, we will be happy to provide you with a quotation.